This is a part of an article that was published in the Eichler Network eZine. See reference to the source at the end. 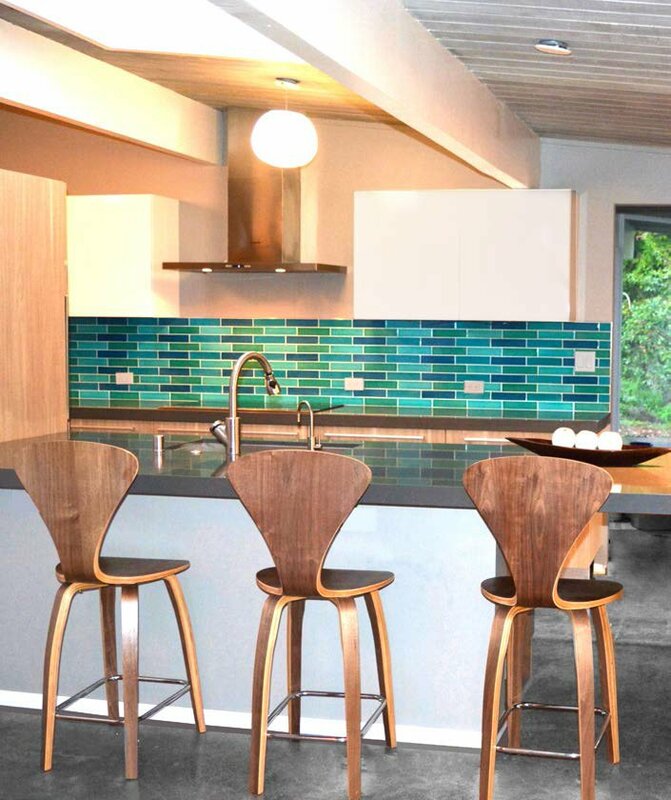 AMERICAN OLEAN – QUICKILVER: From Eichler kitchen by Keycon via owner Jim Leung. Lowes.com. ISLAND STONE – PALMS: From Go2 Design, installed here in an entertainment room in a San Jose Eichler. L-R: Feras Irikat of Luna Bay Tile, Lucile Glessner of Lucile Glessner Design, and Severine Secret of Go2 Design. In hardworking mid-century modern kitchens and baths, tile offers ideal ways to add a little personality. Pretty materials and unique installations can bring a fresh face to your spaces—paying homage to the architecture while bringing it current with fresh colors and patterns. Materials that are organic in nature, like handmade ceramic tiles or glass, will honor the design integrity of the home. Secret suggests modern colors and patterns because they will revive the space instead of keeping it in the past, which sometimes does not favor the house. Lucile Glessner, a Silicon Valley interior designer and Eichler homeowner, agrees. “Subway tile is a very trendy classic,” she says. “It can be made more interesting by adding texture, using thinner tiles, and setting them in a brick pattern at a third rather than half. 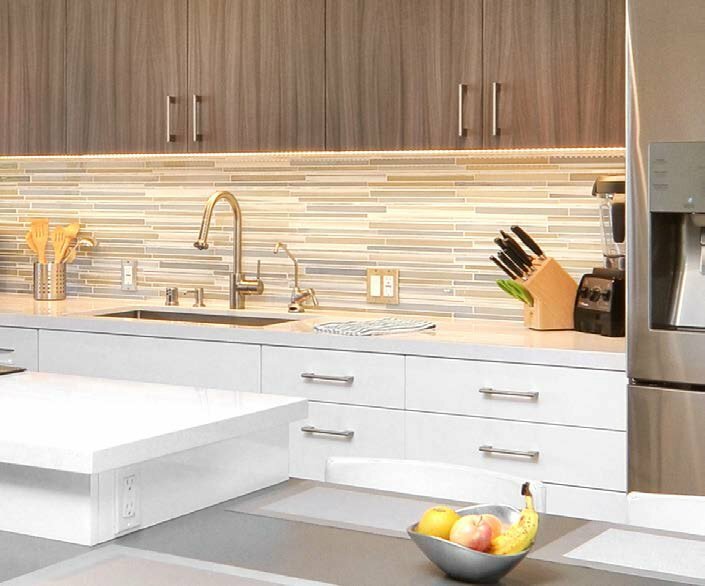 The reason why subway tiles are heralded is also because of the simplicity of their installation. How you lay out your tile can also change the look and feel of the room. Straight patterns work well because it helps simple tiles blend into the background instead of clashing with other design elements in the room. In the straight-lay pattern, tiles are laid side by side in a straight line. 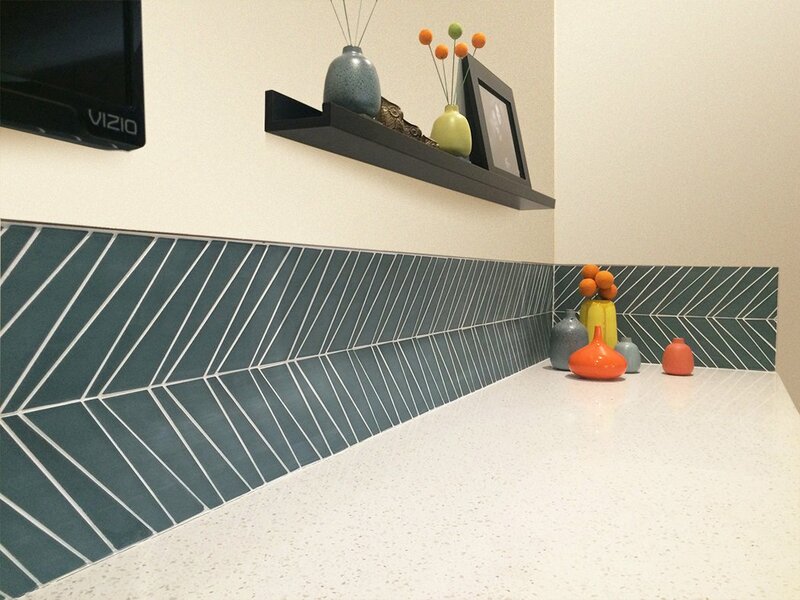 Corners match up, and grout is applied in straight, perpendicular intersecting lines to create a grid-like pattern. This pattern works great with solid-color tiles and is helpful in rooms where you have more complex patterns in fabrics or furniture. Brick patterns, also known as running bond or offset patterns, are also used with rectangular tiles. The end of each tile is lined up with the center of the tiles above and below it. The offset grout lines trick the eye into focusing on the overall pattern, which makes for a great choice on walls with uneven surfaces and for projects that use handmade tiles that have small difference in tile size. Pair decorative mosaics with simple countertop surfaces, like engineered quartz slabs from Caesarstone, Silestone, or Neolith. A very smooth linear natural stone, like soapstone or limestone, both of which do not have a lot of veins and spotting, could also work for countertops and floors, Glessner adds. To save money, designers recommend spending less on field tile—the tile that goes on all walls and the shower floor. “You should splurge on a backsplash, because it can be a great focal point, and you need very little of it. Just a few square feet can make a great impact,” Secret says. But avoid anything too fancy or intricate. Simplicity with a twist is the goal, because it will flow with the linear, unadorned lines of the home. “I would stay away from the Moroccan and Spanish patterns ​that are in vogue, along with anything too Mediterranean in tone or style, along with non-geometrical and flowery patterns,” Glessner recommends. Color is where you should make your statement if you want more drama. Texture, contrast with neutral colors, and natural materials can make a space very interesting.